It's been a pretty busy time for us- as always right now! I am starting up my nutritional business which is needing lots of time invested, as well as looking after my girls, homeschooling and planning our 10yr wedding anniversary celebrations! Although loving being busy, you know what I did yesterday? I cheated with the food side. Totally. I called Will at work and had him stop at the Natural grocery store and buy ready meals! GASP! The horror! (This is totally my halloween angle, hehehe) Though it's not really that bad at all, we all have those days, and sometimes the 'holiday' from making the food and taking the stress off when you're busy is more important. Besides, I made garlic kale and a massive salad to go with it AND this meal is just about the cleverest thing I ever saw in the food processed world- I had to share! 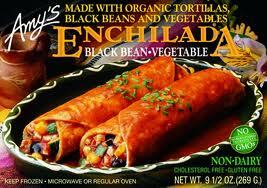 It is made by this company called Amy's, we bought the black bean enchiladas. The meal does not come in a plastic dish, but a cardboard one. It is all organic and is dairy free and wheat free. The corn tortillas are made using traditional ingredients and there is not a hint of sugar or preservatives anywhere on the ingredients. Even the water used is filtered water! So I know it's not the most optimal thing to eat a ready meal, but seriously, this meal saved me last night when I was feeling overwhelmed by things to do- we all get those days sometimes! 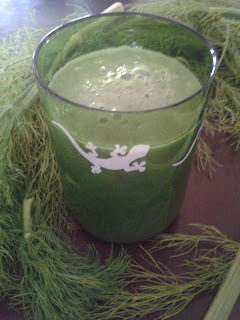 For breakfast, a green smoothie with banana, apple juice, chia seeds and the green tops of the fennel. First time I've used the fennel herb in a smoothie and it turned out perfect! Really tasty and different, with a very mild aniseed flavour to it. This is a fab halloween drink- alien slime the girls called it! For lunch we made brown rice, mushroom and walnut burgers which were delicious! 'Why do these taste all ricey' asks Dorrie. 'Because they have rice in!' I replied. 'Ahhhh' she says all knowingly and very smug- this child has a pretty good palate already ;) I added in some leftover carrot pulp from juicing the day before and used flax to hold them together.They held, but not perfectly so this recipe needs some tweaking. When snack time came around we cooked up a tasty treat as the girls had a friend coming over to play. We made peanut butter oat flap jacks, sweetened with honey and binded with coconut oil. Another experiment dish, they also need a little tweaking- they crumbled a bit too much, and as such weren't photo worthy- sorry! YOu have such an interesting diet, and I think the fact you're opening up a nutritional business is really really awesome! Thanks Emma! :) I am super excited about it! Those burgers sound great. Can't wait until you perfect the recipe and post it!